When deciding to create an online presence your domain name is probably the first thing to consider. Your domain name is essentially your online identity. It is the first thing your users must know in order to reach you so it should be simple and catchy not to mention relevant to your work. There are multiple domain name providers to choose from and to make things easier, we have gathered up the best ones for you. After acquiring a domain name, you must point it to your web host. Just follow the instructions given below to easily set it up. Right after adding your site to MagicPress, your MagicPress panel will look like this. For your site to be available to the public, you’ll need to configure your domain settings. Specifically, you’ll need to change the name servers on your domain registrar to the ones provided in the nameservers setup section of your MagicPress panel. Clicking set up your nameservers will reveal the name servers you’ll need to enter for your domain. Note that the values shown in the image above are only examples. You need to use the values provided in your MagicPress panel. Then, you’ll need to visit your domain registrar, in this case iPage, and perform the following steps. Log in to your iPage Control Panel. Select the domain you want to edit. 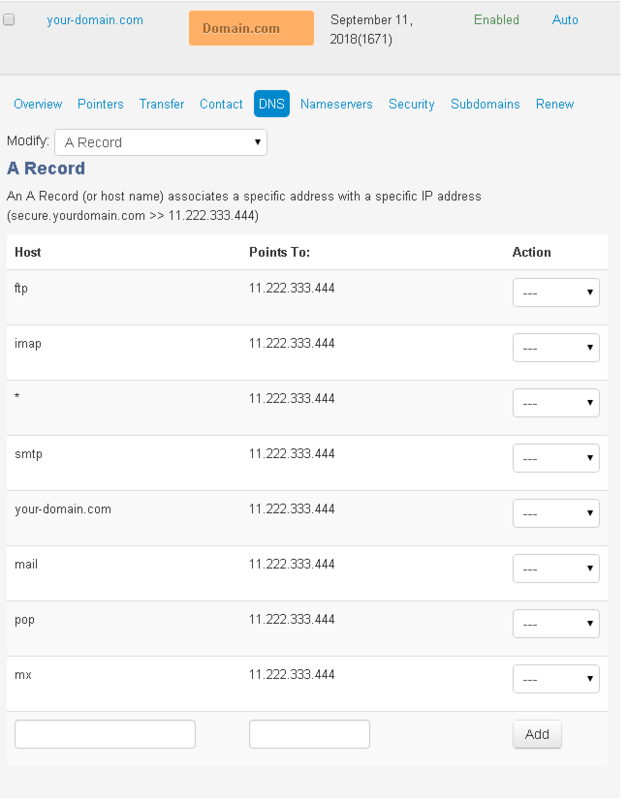 Use the interface provided to modify the nameservers for your domain. 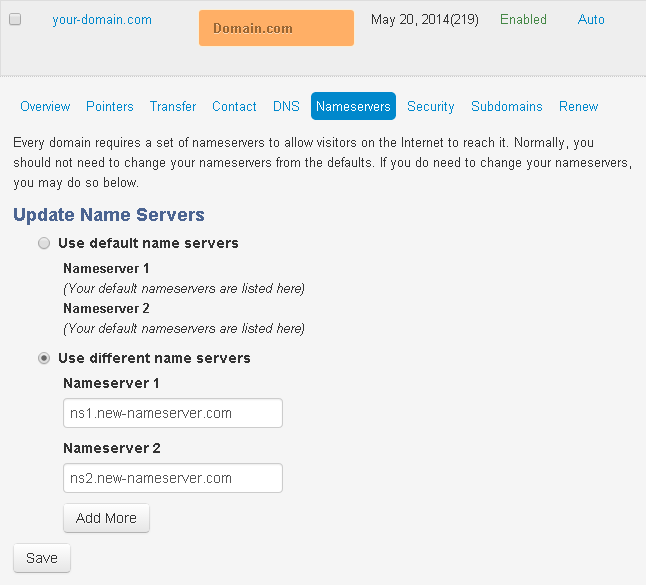 Select Use different name servers to use our nameservers. Click Add More to add more than 2 nameservers for the “Use different name servers” option and fill out the respective fields with the name servers provided in the MagicPress panel shown above. Click Save when you’re done modifying your nameservers. Note: Once you have made changes to your nameservers at the registrar, there will be 24-48 hours of DNS propagation during which your website may not be available. 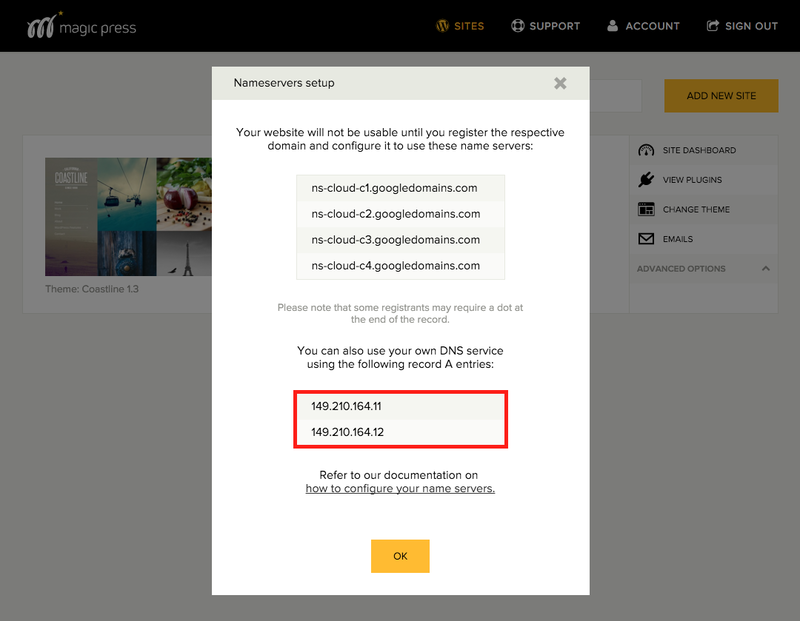 Alternatively, you can direct your domain to MagicPress by creating an A record in the DNS settings of your domain registrar. First, click set up your nameservers on your MagicPress panel. This will reveal the data that needs to be entered in the A record. Use the Modify drop-down to select the type of DNS record you want to modify, in this case A Record. Leave the host field blank. Enter the IP address provided in the MagicPress panel (shown above) in the respective field. Click Add to add the A Record. A confirmation message will appear. Note: Once you have made changes to your DNS settings at the registrar, there will be 24-48 hours of DNS propagation during which your website may not be available.